Bubble tea was served in light bulb-shaped glasses at one Afternoon Social site. One hospitality management company is going gourmet with its coffee bar treats—and turning the afternoon pick-me-up into a fun hangout. Forget the dry muffins or crumbly cookies. New York-based Restaurant Associates is putting a creative spin on the post-lunch snack offerings. 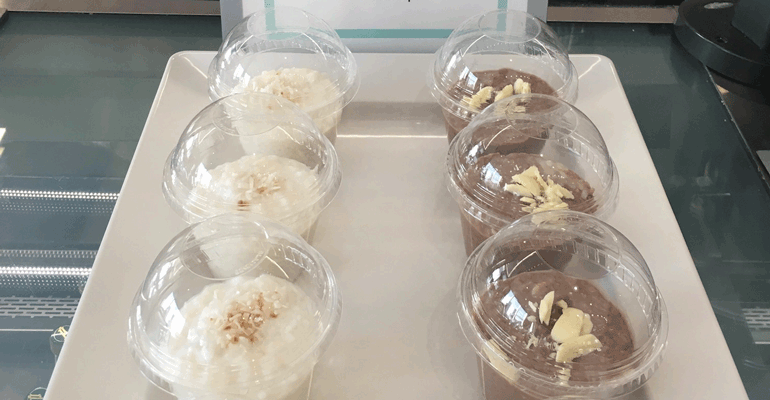 The hospitality management company’s Afternoon Socials concept offers surprising new treats to increase late-day participation at its cafes and coffee bars, when sales tend to dip. And the results are proving a win for clients and their customers. The concept started out with build-your-own-sundae events. Restaurant Associates suggested hosting ice cream socials at some of its clients’ coffee bars as a way to boost activity later in the day. By mid afternoon, most customers are already looking for something to help them re-energize—and giving them a new reason to come to the coffee bar was an easy way to increase sales, says Restaurant Associates Director of Marketing Serena Crutchfield. For those who were already planning to grab a quick cup of joe, the socials were an opportunity to raise check averages. “If they’re already going to the coffee bar and there’s a social happening, they’re now purchasing more than if they just bought a coffee or tea,” she says. 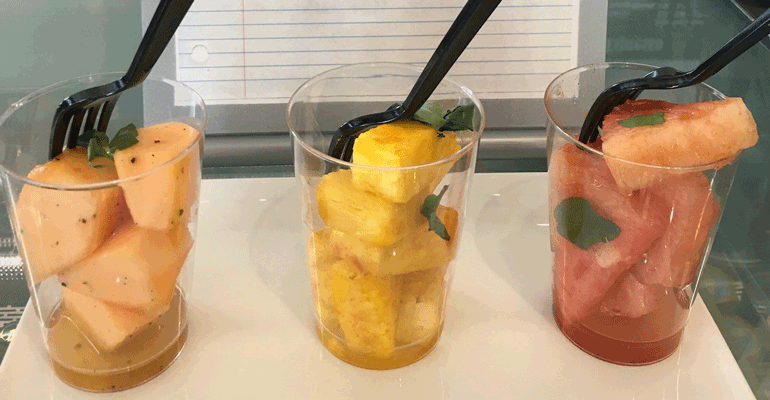 When the ice cream events proved successful, Restaurant Associates decided to expand the program, so now Afternoon Socials offers a range of midday snack concepts. Think comforting sweets like warm churros with ice cream, rice pudding cups or mini fruit tarts; interactive events like build-your-own cupcakes or yogurt parfaits; and even trendy treats like bubble tea, unicorn lattes or fruit cups dusted with savory spices. Events are typically held one Wednesday per month and last for 60 to 90 minutes. For a flat fee of $3 to $5, customers can eat or drink as much as they want. “People are more likely to participate that way, as opposed to a la carte,” she says. But Afternoon Socials is about more than just indulging. “We take it one step further and create a social hub where people like to meet and chat,” Crutchfield explains. True to the program’s name, customers are encouraged to stick around and mingle while they snack, instead of just grabbing a treat and taking it back up to the office. To create a buzz, upcoming socials are promoted on site with signage and banners, as well online via email blasts and social media. “The goal is to get the word out ahead of time, so people can plan for it and come,” says Crutchfield. Afternoon Socials doesn’t have a set menu. “Each account is different in what their clientele likes, so it varies,” Crutchfield says. Conservative locations like financial institutions might opt for more traditional offerings—like coffee with a warm brownie. But creative spaces are a different story. 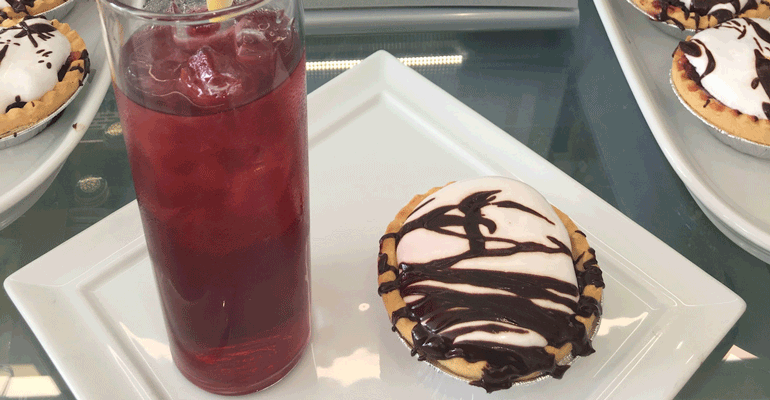 Unexpected, Instagram-worthy treats tend to win out—like bubble tea served in light bulb-shaped glasses or milk served in an edible cookie cup. “For younger crowds, a lot of people take pictures. They’re not getting it because they want a cookie. The concept is just cool and innovative,” says Restaurant Associates Senior Marketing Manager Matt Pisano. Often, on-site managers test out new snack concepts based on client requests. Once a concept is fine-tuned, best practices are shared so other locations can try them. Since the events are held at existing coffee bars and cafés during normal operating hours, running them is easy and inexpensive. “The labor is already at that set spot, so you’re not bringing in additional staff,” explains Crutchfield. In-house items are utilized, and are run at 33 percent food cost on average. Best of all, the events drive up revenue in a big way. “We’ve seen a strong correlation between regular afternoon social programming and sales,” Crutchfield says. On Afternoon Social days, one account boosted its visibility by 7 percent and its sales by 24 percent. As an added bonus, Afternoon Socials just make guests happy. Coffee bars and cafés are rated more favorably on comment cards, and customers share pictures of their treats on social media.